Our Junior Academy has over 150 active members – boys and girls. We offer coaching and competitive team hockey for School Years 4-11. Our Junior Academy is the heart of the Club and makes a major contribution to the development of young players to progress to our senior league teams. 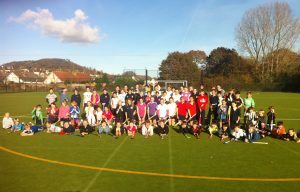 We enter age group teams into the Devon Junior Hockey tournaments and nominate players showing exceptional potential to the England Hockey Player Pathway for additional coaching and talent development. Our Club is totally run by volunteers – Club players, parents (playing and non-playing) and other volunteers. They give their time and enthusiasm freely to create the best possible opportunities so that our youngest members can play hockey, train and compete, stay fit and have fun playing a great sport. Volunteers are always welcome – no hockey knowledge is required! We achieved national Clubmark accreditation in Jan 2017 and were named England Hockey’s ‘Club of the Month” as the first club to meet the new accreditation standard. Read more about our approach to coaching and how we encourage youngsters showing potential to engage in the Player Pathway in Devon. We operate at two venues – Sidmouth and Ottery Leisure Centres – alternating between the two each half-term. We’re meeting in Ottery until Christmas, Boys’ 10-11 am and Girls’ 11-12 am. Our Rusty’s session takes place at the same time and place as our junior boys’ training session. Led by a qualified coach, Rustys provides opportunities for those returning to hockey or for those looking to take up the game for the first time. Coaching sessions are mixed gender. Sundays 10:00-11:00, venues as above. Rustys break for both Sundays in the Autumn and Spring half-term holidays.